You guys, I lied. I lied to you and I lied to myself. I lied when I said I didn’t really care about wedding decor. I really, truly, honestly, wholeheartedly thought I didn’t care. But I’ve come to learn that that’s a huge fib. I realized it was a lie the first time we recently met with a florist and my mouth basically rambled about my vision for nearly an hour straight. Thanks to Pinterest I actually developed a vision and once that happened, well, there was no turning back. At one point Robert and I were cracking up about how I sounded like a Portlandia episode. “I want it to look like the flowers were picked fresh from a garden. But not wild flowers like they were plucked from a hillside, flowers that look like they were grown in a garden in Vermont. And I don’t want them to look too perfect. I want them to be somewhat asymmetrical with lots of different textures, just not too whimsical.” Oh geez someone put a sock in my mouth! We’re also going to serve local free-range organic chicken and his name is Collin. I’ve just come to realize that flowers/decor are one of the biggest ways in which you get to put your stamp on the day. It’s one of those things that’ll make our wedding look and feel different from others that have happened before in that space. Of course, I still want to remain realistic and minimize unnecessary waste and expenses. In fact, there are several places in which we’ve decided to do little or no decor at all. For instance, in the room where we’ll hold the ceremony, the lovely bridesmaids, handsome groomsmen and their adornments will provide all the beauty we’ll need in that space. And for cocktail hour we may do little more than votives (supplied by the venue) on the few high tables. 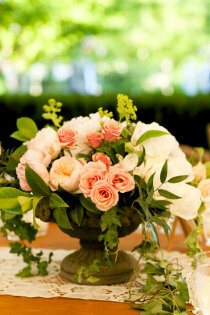 But I’ve got a sea of ideas floating around in my head for centerpieces, bouquets, and other items, oh my! You all know how much I loved the idea of a Vermont wedding. Sometimes a piece of my heart still wishes we were getting married outdoors surrounded by lush green rolling hills, but it just wasn’t meant to be. Still, even though we decided to tie the knot here in Chicago–at a venue without any outdoor element–flowers are one of the ways we can still bring that outdoorsy, countryside feeling into the venue. And to be honest I think that’s what helped me turn the corner: When I realized that with some smart floral decisions we could still get that feeling I wanted all of the pieces felt like they’d finally come together. It was the confirmation I needed to know we’d made the best decision, getting married in a place we live and love, yet can still feel that sense of nature around us throughout the day. One of my favorite parts when it comes to discussing decor still makes me smile when I think about it. On our way to a florist appointment I asked Robert if there was anything he wanted or had in mind and he said he hadn’t really thought about it. I told him what I envisioned and he was on board (yay!) Well, we’re sitting with a florist and Robert’s being pretty quiet. Then all of a sudden he states exactly what he’d like for the guys’ boutenniers. And then he spits out a few other ideas and explains that he’d like to have them in some decor items, too. I’m not going to mention what those details are yet (they’re definitely different and you’ll have to wait and see! ), but I’m totally game for all of them. The details he requested and the ones in my vision don’t exactly mesh so perfectly. Still, I’m in love because I think they’ll be the ideal balance between the things we both adore and the places we each come from. As cliche as it may sound, we really are two very different people with unique experiences and complex personalities coming together to create a life, a family, and a future that’s distinctly our own. And as different as we are, together we just work. So what could be more fitting on the day we commit ourselves to one another than to be surrounded by elements that may appear world’s apart, but seamlessly fit together in a special, beautiful, and one-of-a-kind way? This entry was posted in Wedding on February 13, 2013 by Paige Greenfield. I love it! I suspect I’ll be the same way – initially thinking I don’t want any theme or anything, but then I’ll end up doing everything I said I’d never do 🙂 Can’t wait for September!! I really admit that decorations in our wedding is important it gives spirit and make our wedding more memorable.It gives attractions to the guests.